Main frame constructed from 4” square x 1/4” wall structural tube with continuous welds. 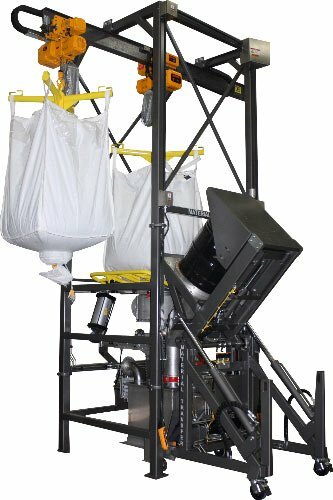 Dual Spider-Lift™ bulk bag lifting frames. 304 stainless steel Flo-Lock™ slide gate system quickly halts material flow for partial bag discharge. 304 stainless steel Seal-Master™ bag spout access chamber enables optimal operator access to bag discharge spout. 304 stainless steel Sure-Seal™ pneumatic bag spout clamping system seals bag discharge spout to discharge transition for dust-tight discharge. Unit features an integral Lift & Seal™ Drum Discharger to allow introduction of drummed materials into downstream process.